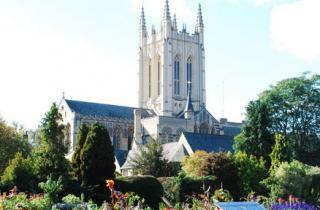 The annual Suffolk Harvest Festival takes place at St Edmundsbury Cathedral, Bury St Edmunds, on Sunday 11 October. From 10.30 am a Farmers’ Market will take place on Angel Hill with stalls provided by Suffolk Market events. The perfect chance to stock up on some great local products. Join the annual harvest service at 3.30 pm in the Cathedral. All are welcome to this wonderful occasion at which thanks are given for the Suffolk harvest. The Cathedral is filled with seasonal displays. During the service the Suffolk Agricultural Association’s Long Service Awards will be presented to those who have devoted many years to the industry in recognition of their dedication and hard work. Don’t miss the display of agriculturally themed artwork created by Suffolk school children. The speaker will be the Reverend Canon Glyn Evans DL., Honorary Chaplain of the Royal Agricultural Benevolent Institution (RABI). During the service a collection will be taken for the work of RABI (Royal Agricultural Benevolent Institution). Suffolk Harvest Festival is organised in conjunction with the Suffolk Agricultural Association, the National Farmers’ Union (NFU), St Edmundsbury Borough Council, Young Farmers and the Country Land and Business Association (CLA). After the service, tea is available in Pilgrims’ Kitchen (access via the Cloisters). Suggested donation £1.